If you started your project in Excel but need to manage more complex schedules, resource sharing, and tracking, you’re probably ready to move your data into Project Plan 365. You can do this by using the Import Wizard. Just follow the steps to import the data in a new or existing project, and the wizard automatically maps it to the appropriate Project Plan fields. In Project, click File > New. On the New page, click New from Excel workbook. Locate and select the workbook you want to import and click Open. 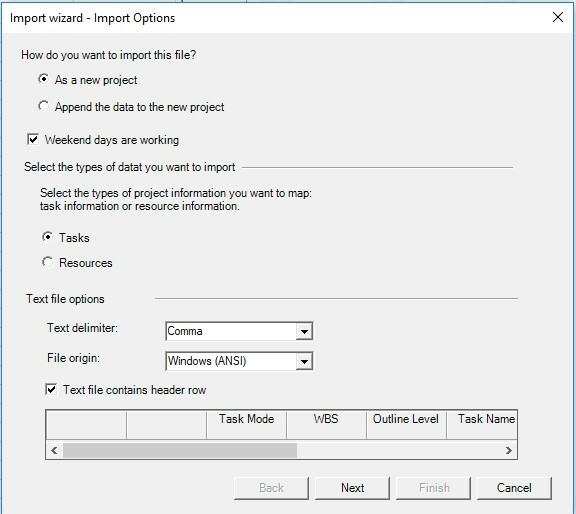 The Import Wizard will appear so you can get started on importing your data into Project Plan 365. In Project, click File > Import/Export. On the Import/Export page, click Import Files, and then Import from Excel. 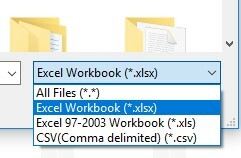 In the Open box, click the arrow next to Excel Workbook (*.xlsx), and pick the format in which your file is saved. Besides opening Excel files, you also have the option to import data from CSV files. Decide if you want to import your data into a new project or the project you have open. 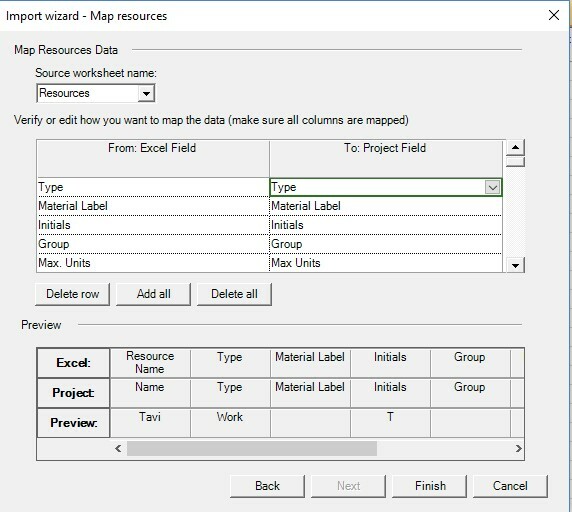 Pick the type of information you're importing so the wizard can map it from Excel to Project Plan 365, and click Next. Verify the mapped fields, make adjustments as needed. Click Next if you decided to map both Task and Resources. Press Finish to finalize the import process. When importing data from a CSV file you also have the option to select how the information is structured (what is the delimiter, I.e. comma, semicolon and what is the origin of the file). 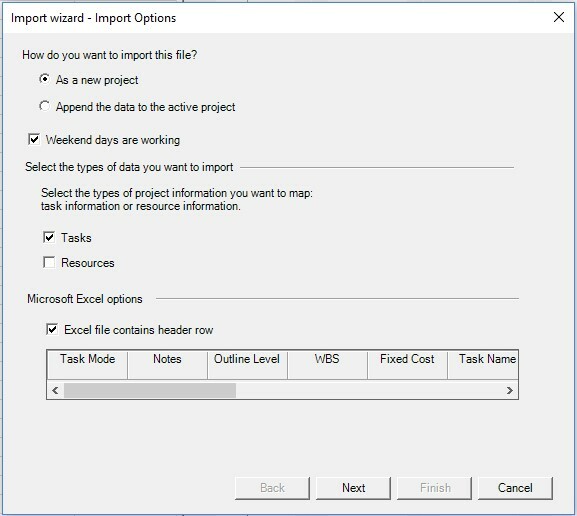 The Import Wizard will, by default, import data from the first sheet in the Excel file. If your data is on another sheet, you will need to select in the Import Wizard the name of the sheet you want to use. Data is imported to 2 distinct data areas: Task or Resources. Imports will not update more than one data area at the same time. Excel datasheets will need to be divided into these areas of data. For example, if you want to import information about both Tasks and Resources, your Excel file will need to have two sheets, one with information about tasks and one about resources. Create any customized fields before starting the import process. When possible, create the customized field names to match the names in the Excel file. Optional but helpful. 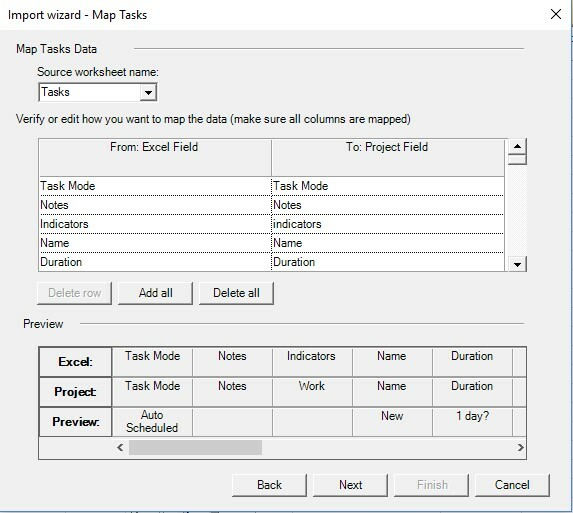 Be aware of which Excel file fields will be mapped to which Project Plan file fields before starting the Import Wizard. Not all fields in the Excel field are required to be imported. When mapping the columns from your file you will have the opportunity to pick which fields you will import by deleting the unnecessary ones (using the Delete Row button). Start and Finish dates when imported into the Start and Finish fields in Project Plan 365 will create Start No Earlier Than constraints for the tasks. Open the Project Plan file you would like to import the data into or create a blank file. Select if the import will be bringing the data in a new file or append to the existing open file. If you select “As a New Project” a new file will be opened using default option settings and default blank project file. Select if Saturday and Sunday should be set to working days in your project. Select if the data will be directed toward Tasks or Resources. One or all may be selected. Select if the imported file has column headers. If there are column headers in the Excel file this information will be used to match field names from the import file to field names in the Project Plan file. The header row will not be considered valid content data and will not be imported. If the imported data does not contain headers, column positioning will be matched with the fields on the import map. Select the source worksheet – default is the first sheet in the Excel file. The left side of the view will have the fields in the imported Excel file. Select field values on the right side of the view to map the Excel values to the Project Plan 365 fields on the right. Click Next if you have other type of data to map (Resources) OR click Finish to finalize the import. Data might have been imported to columns that are not being shown on the currently viewed table. Insert imported columns into any table to view the imported data. Watch for error messages that occur during the import. They might be indicating scheduling issues with some of the imported tasks which might need attention. You can also export data from Project Plan 365 to Excel for data analysis and visual reporting.